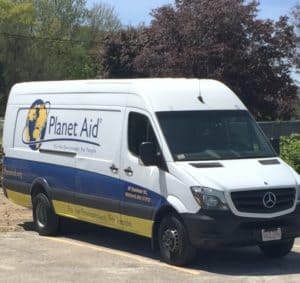 In this online route planner case study, we explore how PlanetAid, a busy non-profit that collects and recycles clothing and textiles, uses RouteSavvy route optimization to save time & money through more efficient routing of its fleet. 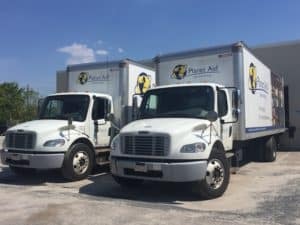 With a fleet of approximately more than 100 vehicles, PlanetAid’s drivers leave their various locations around 4:00 am and return around 3:00 pm, each with a very busy day and about 20 to 30 locations to service per driver. “Although the drivers do not necessarily need to interact with the local business owners for each donation bin that they are servicing, more efficient routing leads to more efficient servicing – because no one wants to go to donate their clothes to find the bin full,” she said. Ms. Costs said the two top functions of RouteSavvy that are most useful for PlanetAid are the ability to create multiple routes and the ability to save project files. PlanetAid management also chose the RouteSavvy online route planner because it features an interface and functions that are very similar to Microsoft’s MapPoint, a system that PlanetAid had used until support for MapPoint was discontinued in 2016. They also chose RouteSavvy because of its ease of use, since many different users with different backgrounds use the software. RouteSavvy Online Route Planner Saves PlanetAid 2 Hours Per Driver, Per Day! After using RouteSavvy, PlanetAid found that they are saving an average of 2 hours per driver, per day, according to Ms. Costa. The savings in time, labor, and fuel costs have proven very helpful for this dynamic non-profit.